Join High Peaks for Scenic & Historic Hikes Nov. 17 (RESCHEDULED from Nov. 10)! Please see information below. 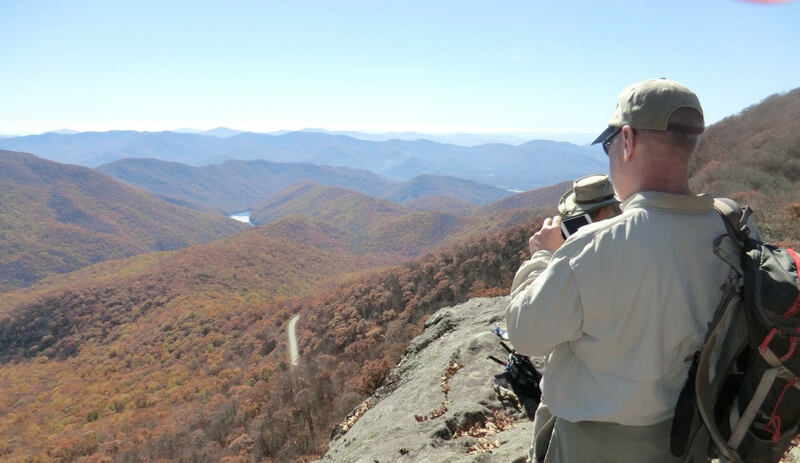 Join the NC High Peaks Trail Association on Sat., Nov. 17 for one of two hikes along the Mountains-to-Sea Trail, with both hikes including a visit to the ruins of the historic Rattlesnake Lodge near the Blue Ridge Parkway. The longer hike is a very strenuous 7.6 miles starting at the Craggy Visitor Center on the Parkway, climbing 600 feet over Lane Pinnacle and Rich Knob before descending 1,200 feet to Rattlesnake Lodge and Tanbark Tunnel on the Parkway. Views from the peaks should be spectacular. The shorter hike begins at Craven Gap and proceeds 4.4 miles, climbing 600 feet and following parts of the historic Ambler Carriage Road before descending to the Lodge ruins and then to Tanbark Tunnel. The Lodge was constructed as a summer home in the early 1900s by Dr. Chase Ambler of Asheville and included a swimming pool and waterwheel that generated electricity. Nothing is left but foundation stones, but a visit does offer the opportunity to imagine life from a day gone by. Hikers for both expeditions should gather on the Burnsville Town Square at 8:30 a.m. Transportation will be provided in Yancey vans for a donation of $5, reservations required by the evening of Thursday, Nov 8. Pets are not allowed on the vans, so if you want to bring your leashed dog on the hike you must provide your own transportation. Bring lunch, snacks, water, hiking poles if you use them, rain gear and plenty of layers depending on the forecast. To make your reservations or for more information, contact the appropriate Hike Leader, Dennis Smith for the longer hike at dennissmith4141@gmail.com or 828-284-4000 or for the shorter hike John Whitehouse at trails@nchighpeaks.org or 828-682-3217. Photo Info: Hikers should get views like this on the longer of the two hikes High Peaks will lead on Saturday, Nov. 10.